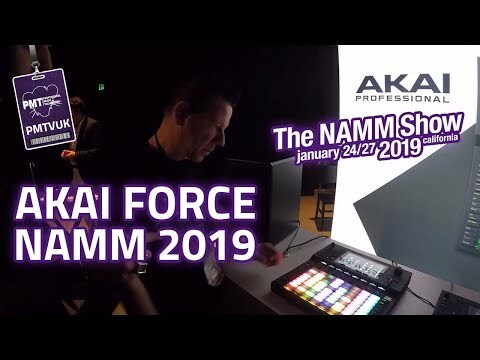 Akai Force is a standalone Music Production and DJ Performance System that continues where the Akai MPC Live and APC Series Ableton Controll..
Akai Force is a standalone Music Production and DJ Performance System that continues where the Akai MPC Live and APC Series Ableton Controllers left off. Fusing clip-launching, step sequencing, sampling, synth engines and tactile touch screen control into a standalone, performance-driven device, Akai Force combines must-have modern functionality with an ultra-intuitive workflow. Force represents a completely unique music making experience that effortlessly caters to live performers and studio producers alike. No more fiddly DAWs, no more complex studio rig cabling. This is truly in-the-box music production for forward-thinking musicians. From DJs seeking a full featured, standalone clip launching solution to enhance their sets, to musicians looking to add live sampling and adaptive backing tracks to their performances, Force’s intuitive interface and performance-driven feature specification lends itself to both applications effortlessly. Additionally, producers seeking a sketchpad for ideas will appreciate Force as a truly standalone production experience without compromise. Akai Force features an 8x8 RGB clip launch matrix, a 7-inch full-colour touch-capacitive multi-touch display, 8 touch-sensitive knobs with graphical OLED displays, 2 audio inputs, 4 audio outputs, MIDI and CV I/O. Together, this comprehensive versatility allows the user an unprecedented degree of creative freedom and expression, while remaining totally free from constraints of being tethered to a computer. At the heart of Force is an intuitive clip-centric workflow that forms the creative core of any performance. Combine multiple modes with plugin tracks, MPC-Style drum tracks, Audio tracks, Keygroup tracks, MIDI tracks and CV tracks to define clip types, then sculpt clips via step sequencing, drum pad performances and note data either from the onboard grid editor, smartscales, chords or progressions. Force has been painstakingly designed so you don't miss out on any of the essential music production features you've become accustomed to with traditional DAW or software solutions. With almost every parameter and function within arms reach, without having to scroll through endless menus, Force offers a hands-on, intuitive workflow. Additional features include time stretching/pitch-shifting in real time, as well as the ability to record 8 stereo audio tracks. Hook up your external hardware, MIDI or analog synths and use Force as the central hub of your studio. Force features over 10GB of on-board kits, samples and effects by AIR Music Technology, including the TubeSynth, Bassline and Electric synth engines. It also boasts an additional synth called Hype, a preset and macro-based synth combining several different synth engines into a single easy-to-use package. With Akai's prestige of MPC kits, rest assured that Force has enough in-the-box to make amazing music from scratch. It comes with 248 Kits, 16 Demo Projects, 2500+ loops and 500+ patterns. Similarly to Akai's MPC series, you can expand the library of your Force unit by hooking up a 2.5" SATA drive connector. Force is compatible with both SSD or HDD drives, as well as SD Cards and USB memory sticks, so you can take your whole sample library on the move.